When you think about traffic on the roads, your mind usually goes to cars, trucks and other vehicles. But in the summertime, traffic often includes the two-wheeled type, such as cyclists and motorcycles. Although they may take up less space on the street, cyclists and motorcyclists have the same rights and responsibilities as motorists. When approaching a motorcycle or bicyclist, slow down. Never honk your horn and be extra cautious if there are children on bikes. Make sure to give motorcycles adequate room to maneuver, especially in changing road conditions. 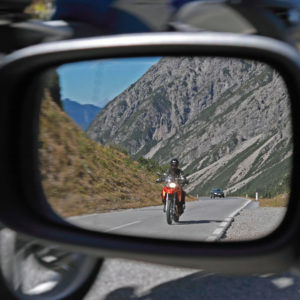 Maintain a safe driving distance of at least two car lengths between the front of your vehicle and the rear of a motorcycle traveling in front of you. Never try to share a lane with a motorcyclist – they are allowed the same lane space as any other vehicle. Use your mirrors and windows to check for clear passage before changing lanes or making turns. Pay close attention to your blind spots. Always use your turn signals when making a turn or changing lanes. If passing a cyclist, allow for plenty of space and only pass as you would any other vehicle – when it’s safe to move over into an adjacent lane. Look both ways, and look again, before entering an intersection from a stopped position. Remember, there’s no such thing as a fender-bender with a motorcyclist or a bicyclist. In your vehicle, you are protected by air bags, seat belts, and the entire structure of the vehicle. A motorcyclist or bicyclist is completely exposed. That’s why it is so important for all drivers to make safety a priority and respect the rights of everyone on the road.